Theresa May knows perfectly well that the Islamist tyrants who rule Saudi Arabia have been conducting a brutal campaign of airstrikes in Yemen that have resulted in the deaths of tens of thousands of people, including over 5,000 children. And she knows that a significant proportion of these airstrikes have been classified as war crimes because they've been carried out against civilian targets and refugees. Theresa May also knows that the Saudis have been blockading food and medical supplies to the country too, meaning that famine and preventable diseases are rife. She knows because all of this stuff has been debated in parliament, where her Foreign Secretary Boris Johnson made the grotesque argument that Britian should continue selling the Saudi tyrants the weapons they're committing their war crimes with because if Britain doesn't profit from these war crimes, someone else might. Yesterday the Saudis carried out yet another air strike in the Ghamer area of Saana, resulting in at least ten civilian deaths including women and children, with several more suffering severe injuries too. Swathes of the UK mainstream press continue to turn a blind eye to this campaign of Saudi airstrikes against Yemeni civilians, their war crimes, their execution of refugees, and the famine they're creating because this stuff is really inconvenient for Theresa May and the Westminster establishment club who rolled out the red carpet for the Saudi tyrants just a few weeks ago in order to flog them even more weapons to commit these atrocities with. And even if you're the kind of person who can turn a blind eye to these military attacks against civilians and the use of famine as a military tactic just because the victims are brown people in a far off land, don't forget that Theresa May is still hiding the report into the funding of terrorist activities in the UK that allegedly points the finger at the Saudi tyrants. Theresa May simply doesn't care about the victims of her actions. She doesn't care about the dead children in Yemen, or those dying from famine and preventable disease, or even that her Saudi mates are suspected of funding terrorism in the UK. 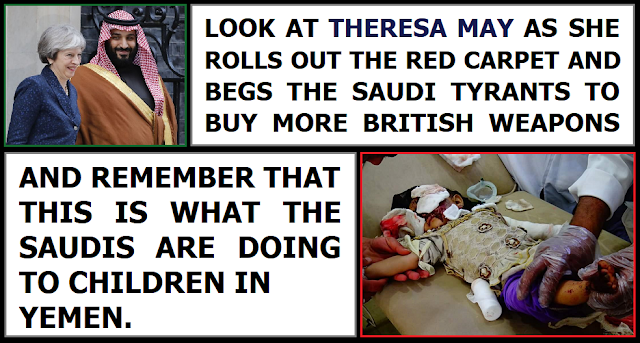 All she cares about is making sure that Britain stays at the top of the list to supply weapons for the Saudi tyrants for them to commit their war crimes with. And to think that she pretends to be a Christian.